Javier Ramirez is known for his aggressive sound full of body and core. He is quickly making a name for himself as a refined saxophonist whose robust tone and blistering technique captivates audiences’ worldwide . His vitalizing performance is highly rhythmic and bold, while acutely sensitive and touching. The California native was quickly impassioned with the saxophone at the age of 11, and was constantly asked to stop practicing and tend to basic needs such as eating and sleeping. Upon hearing the works of John Coltrane, Charlie Parker, and Michael Brecker, an obsessive love affair with jazz lit aflame. Early private lessons with esteemed saxophonist Mike McMullen propelled his technical facility and fostered rapid musical maturity and personal growth. 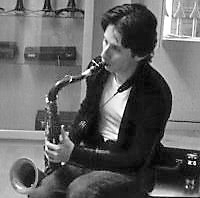 At the age of 17, he studied breathing techniques with R&B saxophonist Walter Beasley and Latin Jazz interpretation with Oscar Stagnaro (Bassist with Paquito D’Rivera) at the 2000 Berklee in L.A. Contemporary Performance Program. It was also at this time that the Sacramento Traditional Jazz Society awarded him a scholarship to further his private studies while honing in the clarinet with Dixieland. After a brief stint performing and touring with local bands, he transferred clear across the country to Miami’s Florida International University, where he studied with Gary Campbell, and privately with both Gary Keller at the University of Miami and international recording artist Dr. Ed Calle at Miami-Dade College. It was this saxophonic trifecta that artfully shaped his professional approach to successful commercial musicianship, selfless dedication to the craft, and borderline enmeshment with his instruments. His career has taken him to every corner of the globe, not only touring, but by sea onboard luxury cruise ships over 6.5 years, performing with numerous guest artists and production shows in show bands for Celebrity Cruises, Azamara Cruise Line, Norwegian Cruise Line, Carnival Cruise Line, and Holland America Cruise Line. Furthering his proficiency on flute has been a close second to the saxophone with mentors Mike McMullen (classical flute with Mong Pil Kim at the SF Conservatory), Viviana Guzman (Jean-Pierre Rampal at Julliard in NYNY), and Bay Area soloist Francesca Anderson (San Jose State University).